The incredible has happened. A billionaire businessman from our time, frozen in secret in the early 21st century, is discovered in the far future and resurrected, given health and a vigorous younger body. He awakens into a civilization in which every individual is formed into a legal corporation at birth, and spends many years trying to attain control over their own life by getting a majority of his or her own shares. Life extension has made life very long indeed. Justin Cord is the only unincorporated man in the world, a true stranger in this strange land. Justin survived because he is tough and smart. He cannot accept only part ownership of himself, even if that places him in conflict with a civilization that extends outside the solar system to the Oort Cloud. 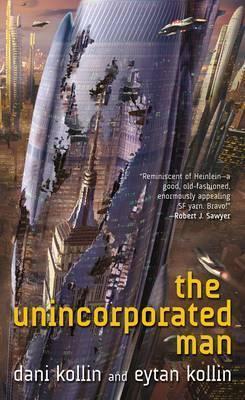 ""Will appeal to Heinlein's legions of fans with its themes of personal liberty and one man's political struggle with the State. . . . "The Unincorporated Man" will tantalize you in with its intriguing premise." "Reminiscent of Heinlein--a good, old-fashioned, enormously appealing SF yarn. Bravo!" ""The Kollin brothers' first novel . . . recalls the emphasis on freedom of the early works of Heinlein and the cutting-edge social commentary of William Gibson and Fritz Lieber." DANI KOLLIN lives in Los Angeles, CA and EYTAN KOLLIN lives in Pasadena, CA. They are brothers, and The Unincorporated Man is their first novel.